We live in a versatile economy. It’s not unusual for companies to hire on a project-by-project basis or let their employees work remotely. Thus, they are minimizing overtime pay and overhead, and in some cases eliminating costs associated with office space or tax laws. In return, their employees are enjoying a little flexibility, taking on more than one project at once, and often earning more than they would as a full-time employee with the company. Remote or temp employees and project-based managers are in more demand than ever. While many companies actually have a full-time project management office staffed with in-house professionals, it’s becoming the norm to hire project managers that may not ever reach a physical office or those who control remote teams, globally dispersed around the world. 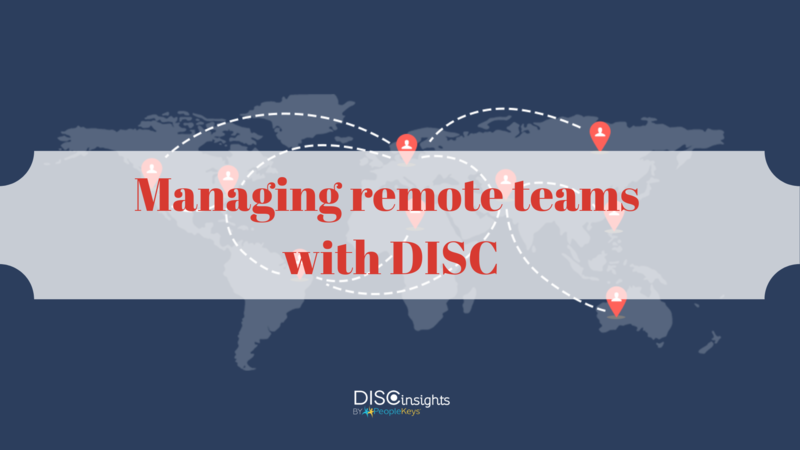 Remote employees may never meet their fellow team members. Given the nature of the current gig economy and project-based hiring methods, many remote employees will never actually meet their fellow team members face-to-face. While some take on existing teams, internal to the organization, there are a number of hiring pools and sites allowing project managers to secure talents based on need, availability, budget and area of specialization. Whether taking on an existing team, hiring contractors through bidding sites or hiring offshore teams for special project or assignments, managers are facing the challenge of getting to know new people on a regular basis, learning their habits, and becoming a motivator to the final outcome of success. Communication is key, but how will one communicate with a team they don’t even know? How will they appeal to the individual needs of their teammates in making sure each job gets done on-time, on-task, and on-budget? For the proactive manager, DISC and a 4D Report covering personality style, thinking style, values and behavioral attitudes may be a game-changing tool in cultivating effective collaboration, productivity, and performance throughout the project lifecycle. First, ensure the perfect hiring match. Securing top talents is only part of the journey. Getting to know those talents and how they will interact with each other is another. Through predictive hiring, a hiring manager can sort out talents, based on tendencies, personalities, and interpersonal activities so teams can be optimized at the very beginning. Although talents are sourced based on their skills and capabilities, the manager must realize that communication is almost everything in the project lifecycle and it must be handled accordingly. How can DISC come to the rescue? Utilizing DISC and a TEAMS thinking style assessment, the ultimate team can be put together. For example, a team leader with a High “D” style and Theorist thinking style will be the idea person driving the project. The project spokesperson and creative director “I” style with the Strategist thinking style will help overcome problems with creative solutions and make sure everyone has fun in the process. The administrative genius “S” style with the Executor thinking style will make sure the “D’s” idea is made into something concrete and usable, and will see the project is finished to completion. The Analytical thinker "C" style will make sure everything is done correctly and well thought-out from start to end. Any team leader can actually perform a pairing of personalities and TEAM thinking styles to roles within the group to ensure maximal performance. Even with a limited understanding of DISC, any successful team leader is subconsciously practicing DISC each day. Various roles are to be fulfilled by finding the best candidate for each position. Someone needs to gather and communicate the details, while someone else provides internal support to the team. Someone will be positioned to keep everyone on-schedule, verify compliance and act as an administrative party for reporting at various milestones and deadlines. Someone will be put in charge of motivating and empowering others, while sparking creative thought processes and creating unity amongst all personality types. A realist will keep the team on-schedule by delegating tasks, eliminating redundancies and minimizing dependencies in-process. Creating a team blindly may lead to a lot of trial and error. Personalities will clash. Jobs will be finished late or lack quality. People will be re-positioned, others will be fired. New people will be brought in, while time and resources are being wasted. Strategically hiring team members through predictive hiring methods, less time is wasted in the on-boarding stages, while more focus can be put into rolling up sleeves and getting the actual job done. Teams will better interact across barriers of land, language, and culture, while effectively expediting each process. Most importantly, the team will be unified under a central vision as each member goes on to achieve new heights at each step of the journey.